Dice candles bring new meaning to the phrase hot dice. You can't roll them, but you can burn them. That's pretty cool, right? With decorations, dice are included as part of a gambling theme, pair dice with cards, poker chips or martini glasses. This first candle catches the eye with its martini glass shape. It includes red gel for 'liquid' and has a single white dice, or die, for the base. 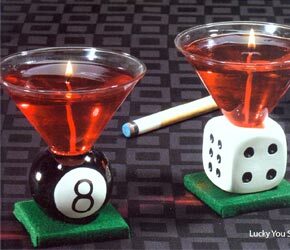 There's also an '8 ball' martini glass candle to complete the pair. Of course, sometimes realism is best: A large chunk of wax carved into a large dice. If that's what you're after, you're in luck! These 4 inch, red, large dice candles with white spots will liven up your party or home quite nicely. The festive red color adds more pizazz than black and white candles shaped like dice. If you want a memorable party, combine these candles with more dice themed party decorations including balloons, confetti and decorative columns. After all, it is all about the dice! If your candle search continues, I have a tip for you: Look for sites that sell supplies for bunco. These often have fun novelty decorations with dice themes and you may be able to find what you need.